Rumor: Is Gotham City Imposters the New Batman Game? Retailers in the U.K. are responsible for launching a rumor that a new Batman game, Gotham City Imposters, is coming next year. 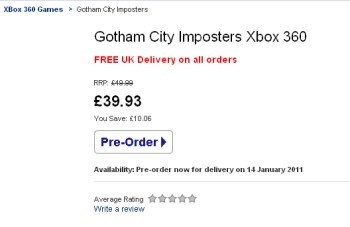 This one is about as rumorrific as you can get: U.K. retailers The Hut, Asda Entertainment and WHSmith are listing a game called Gotham City Imposters for the PC, Xbox 360 and PlayStation 3. The PC version of the game is listed for about $54 while the console versions are about $60, and all three sites are showing a delivery date of January 14, 2011. And aside from that, there is nothing. The assumption, naturally, is that this is a new Batman game that's somehow slipped under the radar, although Gotham is also the name of a real city in the U.K. and a nickname for New York City, so we could actually be looking at some sort of long-overdue SimCity DLC. On the other hand, and perhaps a bit more likely, it could be related somehow to the Batman: Imposters four-part mini-series that began last month. There's no hint as to who is developing or publishing this alleged game; the truth is that the only thing we know is that it takes place in a city called Gotham and it has imposters of some sort. Warner Brothers Interactive had the reins for the last Batman game, Arkham Asylum, so we've dropped them a line asking about this one and if they happen to get back to us, which is about as likely as the Joker taking up a collection to help build a wheelchair ramp for Barbara Gordon, we'll let you know!